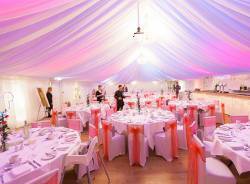 Quite Brazen South West Wedding Band reviews and testimonials from our many happy clients. Thanks so much for being our wedding band and for our card. Everyone loved you and we had an amazing day. We are now preparing for a penguin adventure for our honeymoon. A Massive well done to Shelley and the band for providing and creating such a wonderful atmosphere and entertainment to our guests on NYE 2017. The feedback the next morning was exceptional and some guests have already booked for next year. This is the best feedback we can have. Shelley, we want you next year too. All the best for 2018 and see you in 11 months. Thank you so much for playing at our wedding. We've have had lots of comments from people on how great you guys were, we wanted to dance the night away and you completely took the stress out of making that happen. Your set list had something for everyone and the talent of each one of you shone through. We are very proud of our memento of the signed drum stick. The fact that it broke is testament to the energy that you guys bring to your performances. Thank you once again for giving us a wedding reception that we will never forget. Thank you to all of the band. You were fabulous we had a great time and had lots a great comments on how amazing you were. Thank you Shelley & the rest of Quite Brazen! I think the amount of people tearing up the dance floor showed just how good you were! You were all absolutely brilliant! 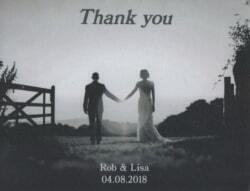 On behalf of Clarissa and Jamie and ourselves to say a massive "thank you" for the entertainment you provided at their wedding on 26th March at the Fox and Hounds. We had so many positive comments about how fantastic your group were and as you could tell everyone really got into the party spirit. It was a great evening and I felt you went above and beyond, so thank you very much. We will certainly be recommending you to our friends and family. I wish you a good wedding season! We would like to send our extreme thanks to Quite Brazen for making our beautiful wedding day extra special. 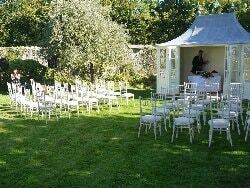 We were lucky enough to have the acoustic set for our ceremony and canapés and the whole band in the evening. From start to finish Shelley and co were professional, cheerful, helpful and above all musically brilliant! I walked down the aisle to Shelley singing "At Last" it was truly a beautiful moment. We whole heartedly recommend Quite Brazen and wish them every success in the future. Thank you from the bottom of our hearts. Quite Brazen were fantastic. 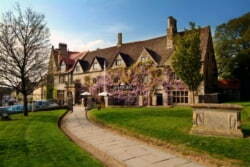 From the start Shelley was open, bouncing ideas, timings and set lists to maximise our wedding. She created a bespoke combination of a DJ set, two live sets followed by a final DJ set taking us into the early hours. Quite brazen kept the dance floor full for the entirety of the night. A month later people are still saying how much they enjoyed our wedding and how good the band were! Shelly's creation of an impromptu dance off is a favourite memory of many. From start to finish the service we received was top notch. The important thing dealing with wedding suppliers is not having to worry about them & the product they were to deliver, we had no concerns with Quite Brazen. Not being local we were unable to see them or any of the other bands live so it was a gamble, however their web presence & the use of online video's meant we had a good idea of what we were getting & took the stress out. The best recommendation was the dance floor was RAMMED! 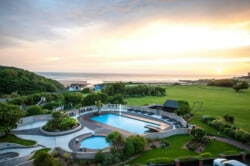 Thanks Shelley & Gang for playing at our wedding at Watergate Bay Hotel. We wanted a band that would have everyone up and dancing from the word go & you certainly didn't disappoint us. All our guests commented on how fab the music was and Shelley has an amazing voice. We would definitely recommend Quite Brazen to everyone! Excellent . I would highly recommend the band as they provided all information before hand and were so helpful if there was a problem. Top rate band and would hire again in future. Outstanding band! Lost for words, thanks for an amazing, tight and highly professional performance. You really helped create an amazing evening. You were a real pleasure to work with from start to finish. We found you professional, friendly and helpful. We particularly appreciated how discreetly you arrived and setup. Many of our guests commented on how great the band was and how you communicated with the audience and encouraged people to dance without being annoying! We loved it! Thank you so much. Quite Brazen were excellent entertainment at our wedding. They were really energetic and had everyone dancing all night. Shelley was very organised and sorted everything we asked her to do, including performing our first dance. The whole band were very friendly and chatty, even when my brother played the drummers drums during a break (sorry about that...) We were really glad we booked you. It was exactly what we wanted. Richard and I would like to thank you so much for the great performance on sat. We had an incredible evening and I am sorry I didn't see you in person to thank you. Many of our guests asked who you were and where you were from and mentioned how great you were. We cant thank you enough and sorry for the time changes! I am sure you must of been a bit hoarse yesterday. Thank you for being so accommodating. All the best for the future. We hope to see you again. Hi Shelley & Gang, thanks again for making our wedding evening go with a bang! Everyone had such a good time!! Quite Brazen made our wedding what it was; all of our guests loved Shelley's cheerful, excited attitude and their song choices fitted perfectly. It felt like we were dancing all night under the stars (actually we were!). What a great band!!! Had a brilliant and varied selection of music. Played all requests and was very interactive with the party. Setup was quick and easy and stayed out of the way. The band also added a disco and which they asked for a selection prior to the wedding. Quite Brazen were quite the best wedding band! Ian was in contact straight away and always happy to answer our many stupid questions. We made a last minute request for 'you've got the love' as our first song, which was met with courageous enthusiasm! 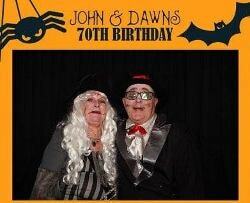 They turned up early, entertained everyone all night and stayed late! Quite Brazen made our wedding party a truly memorable experience. We chose our favourite songs from their repertoire and they mixed them into two happy and lively sets that got everyone dancing. Shelley sang beautifully and had a wonderful way of interacting with our guests. Quite Brazen are brilliant! A massive thank you to the band for the entertainment on Saturday night. I have never seen so many people up dancing at an event before, great work guys. A big big thank you for playing at our wedding it made it extra special. Lots of people were saying how great you were (even though some of them were reluctant to dance!!). You were a great find and we would definitely recommend you. We may have started a craze dancing to sweet child of mine!!!! Thank you again you were amazing. "We just wanted to pass on a massive thanks to you all for taking our room full of people and turning it into a party. Possibly the best 40th a boy could hope for, and I can now descend into middle age happy. 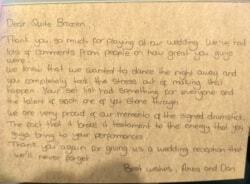 "Thank you Quite Brazen for a fantastic performance at our wedding reception. Shelley made the booking & organising the evening so easy for us. 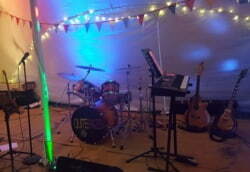 Every one of our guests thoroughly enjoyed the bands choice of songs & partied the night away with us. Highly recomended!" 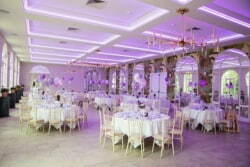 "Thank you Quite Brazen for making our reception the brilliant evening that it was. You are utter professionals, brilliant musicians and you provided such a fun evening to ourselves and our guests. So many of our guests commented on how amazing the band was. Thank you so much for everything you did." "We booked Quite Brazen after hearing a fantastic set from the band on Bay FM. 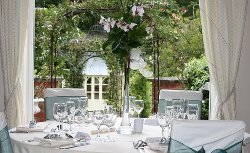 They were very professional in arranging the details for the wedding day and were extremely accommodating in fitting around our plans. We would wholeheartedly recommend Quite Brazen if you are looking for an up-beat and fun group who will delight your wedding guests and keep them on the dance floor throughout the evening." "Thank you very much for your help and sterling performance on Friday night. Everyone has had very positive things to say about you guys, and you really helped round off the evening wonderfully - thanks so much." "Quite Brazen were quite simply the perfect band for our wedding day! You were so lovely to deal with before hand and during the day accommodating what we wanted. We absolutely loved your version of It Must be Love for our first dance. We've had such great feedback from everyone at the wedding not only about the quality of the music - which was phenomenal - but also the personality of the band and how fantastic you were at interacting with our guests. Most importantly everyone was dancing! Extremely professional, gorgeous voice, superb music and lighting, excellent value! Thank you so much." 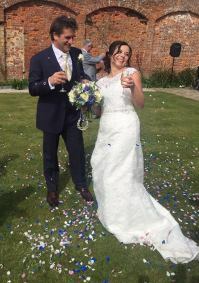 “We were thrilled with the performance Shelley and the guys gave at our wedding, they got everyone up and dancing and really in the party mood. 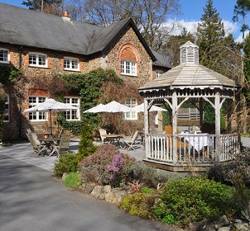 They really topped off a wonderful day and I cannot recommend them highly enough”. 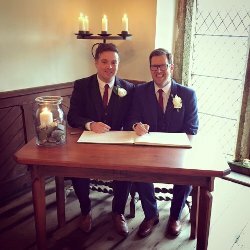 "I am writing to express our immense gratitude and huge thanks for everything that Quite Brazen did to help make the evening of our wedding so amazing. So many people have commented what a great band you are and what a great boogie they had! Your vast musical repertoire and immense euphonious talent, along with Shelley’s dazzling ability to interact with the audience ensured smiles, laughter and a booty-bopping-knees-up all evening! To say I’m chuffed would be an immense understatement. Thanks again for being an exceptional part of our special day." Quite Brazen, The Devon based Wedding & Function band are passionate about entertainment and committed to providing you with a professional service for your wedding, function or corporate event. We feel so honored to be a part of your special day. Please see some of the wonderful feedback from previous happy clients.